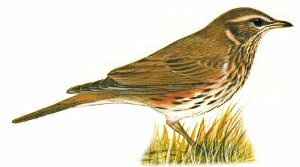 The Redwing has a dark brown back, white underside which is speckled with dark spots, a pale eye stripe and a flash of rust red on the flanks. It often forms large flocks in winter feeding on open fields or berry trees in hedgerows. Breeds in Northern Europe and winters in Southern Europe. A winter visitor to all of the UK where it is considered a red species due to decline. In winter the bird ranges over farmland and parks feeding in open fields or in hedgerows where berries can be found. In harsh weather it will visit garden bird tables and is particularly fond of apples. 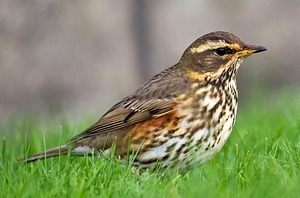 The Redwing visits the UK in large numbers especially in hard cold weather, it is most often seen in small flocks, sometimes alongside Fieldfare and other thrushes. Note the striking eye stripe on this bird, also note the rust-red on flank. The spots on the Redwing are long and smudged unlike the other thrushes which have cleaner rounder spots.